Our growing family of monthly donors provides reliable support that allows us at CHW to respond quickly to urgent needs, and to have a tremendous impact on the lives of those in our care. With your help, we can change the lives of children, women, and families who are battling hunger, a devastating disease, or domestic violence. As a CHW Monthly Donor you will make a world of difference for those at CHW’s projects in Israel. $10 a month: Protects a child at-risk. Children will have a safe place to call home while receiving nutritious hot meals and snacks, ensuring they can focus on learning, playing, and growing. 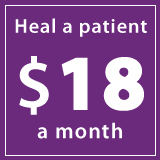 $18 a month: Helps heal a patient who has experienced a stroke. They will have immediate access to life-saving surgery and a chance for full recovery. $25 a month: Changes a life. Support a woman who is struggling day-to-day. She will receive guidance and job skills training, empowering her and her family. To become a Monthly Donor, click here.